The Carbery Monthly Awards Presentation Function will take place in The Westlodge Hotel Bantry on Saturday 8th December at 8pm. John Cleary Castlehaven and Manager of the Cork Minor Ladies Football Team is the Special Guest on the night with Paudie Palmer as M.C. Music by Michael Ronan. January 2018 : Kevin O Donovan Kilmeen/Kilbree - Been elected Vice- Chairperson Cork County Board. February: Carbery Rangers Ballad Group All Ireland Winners's Scór na nÓg and St.James Novelty Act County Scór winners. March: Melissa Duggan Dohenys and Julianne Hayes Clann na nGael : Winning Ladies Football All Ireland Title 2018 at Third level with Royal College of Surgeons Dublin. April: Mount St Michael Senior Football Team Rosscarbery on winning the Cork County Senior B Football Championship 2018. May: Moira Barrett, Ballinascarty : Captain of the Cork Team who won the All Ireland Minor A Camogie Championship for the fist time defeating Galway in the Final. June: Niall Twomey, Ballinascarty and Daniel Cronin St.Mary's. Niall was in charge of the Cork Under 15 Football Team who won the Humphrey Kelleher Tourament and Daniel was in charge of the Cork Under 16 Team Football Team winning Munster and All Ireland Touraments. July: Castlehaven G.A.A. Club : to celebrate their fantastic Club Development at Moneyvolahane. August: Caroline Sugrue, Ballinascarty won and played on the Cork winning All Ireland Intermediate Camogie Team 2018. September: Libby Coppinger St.Colums and Orla Cronin Enniskeane.Both won All Ireland Senior Camogie medals with Cork in 2018. October: O Donovan Rossa Junior Ladies Football team. Won County Junior C Ladies Football Championship. November: Kilbree Hurling Club: winners of Junior A & Junior C Championship & League Double in Carbery also County Junior A Hurling League winners. 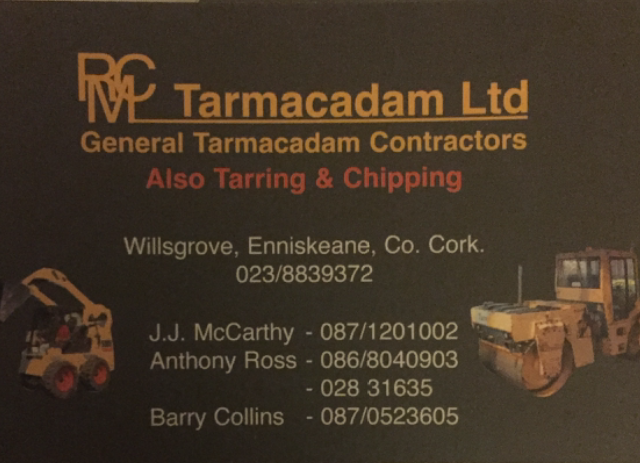 December: Kilmacabea: Carbery Junior A Football winners Championship& League also County Finalists in Junior A Football 2018. Tickets will cost €20 or 6 Tickets for €100.00.